Two years ago, I spent a weekend at Château l’Hospitalet, one of the nine estates owned by Gerard Bertrand, located in the Languedoc in the south of France. I recall Gerard’s passion as he shared his belief in l’art de vivre (the art of living). 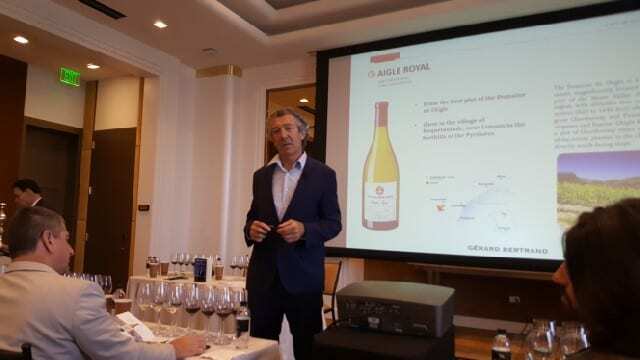 And recently, I was inspired again when he visited the U.S. to host a series of master classes to espouse how biodynamics magnify the expression of terroir in a grand vintage. Gerard Bertrand started making wine with his father 43 years ago in the south of France. By 2002, Gerard began to change his view after reading Rudolf Steiner, the father of biodynamics. Having used homeopathy in his personal life, he connected with the principles of biodynamics and began converting his vineyards. He started with four hectares planted with the oldest Merlot vines. He farmed two hectares biodynamically and two hectares conventionally. He noticed a significant difference and proceeded to convert 40 hectares, then 100 hectares and today has converted all 1,200 acres to biodynamics. Dedicated to the practices of biodynamics, Gerard’s recent visit to the U.S. was to try to explain the influence of biodynamics in wine. In biodynamics, as well as organic farming, an eco-system is created within itself that is organic. Biodynamics is about finding the balance between the soil, the plant and the sky. With biodynamics, according to Gerard, it is about giving the plant what it needs, when it needs it. And, the outstanding vintage of 2015 was a perfect example of how Gerard was able to apply biodynamic preparations to support some processes and compensate for others. The 2015 vintage is considered an outstanding vintage because there was a good spring, a perfect summer with a hot and dry July and thunderstorms in August. The grapes were able to achieve optimal maturity and harvest was dry, allowing the grapes to be picked without pressure. 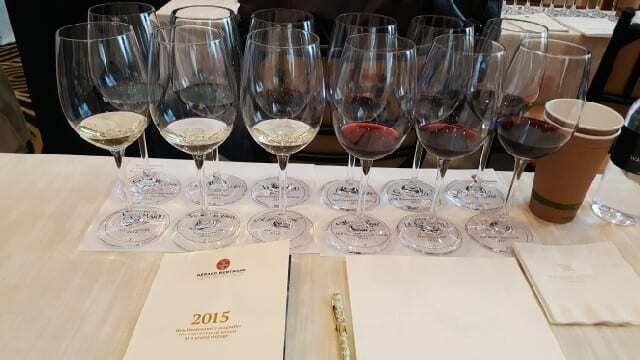 In the end, the quality of the 2015 can be found in the balance of the red wines. Aigle Royal Pinot Noir IGP Haute Vallée de l’Aude 2015 – Coming from the estate Domaine de l’Aigle, located at an altitude of 1,640 feet, the Pinot Noir comes from the highest plot with limestone soils. Matured in new French oak barrels for 10 to 12 months, the wine has a bright nose with aromas of black cherry. On the palate, the acidity hits the front of the palate with a bang and then then coats the mouth. Château de La Soujeole Grand Vin AOP Malapère 2015 (51 percent Merlot, 42 percent Cabernet Franc, 7 percent Malbec) – Located in the Malapère region, the unique terroir is a result of the oceanic influence from the west with the Mediterranean climate. While Cabernet Franc is unusual in the south of France, it is well-suited for this area that is cooler and more humid than the rest of southern France. The 2015 has herbaceous and earthy aromas with notes of dark red fruit and menthol. On the palate, the wine has medium acidity and medium plus tannins and shows great aging potential. Cigalus IGP Aude Hauterieve 2015 (21 percent Merlot, 19 percent Syrah, 18 percent Cabernet Franc, 17 percent Cabernet Sauvignon, 13 percent Caladoc, 7 percent Grenache, 5 percent Carignan) – The second property purchased by Gerard, Cigalus is located in Corbières and is where his family lives today. The original owner, a lawyer based in Paris who bought the property for hunting, had planted international varieties, including Caladoc, a vine crossing of Malbec and Grenache, and hence the wines are IGP wines. The 2015 is a unique blend that resulted in a dark red color with intense aromas of blackberries, black cherries and plum. Chateau La Sauvageonne Grand Vin AOP Coteaux du Languedoc Terrasses du Larzac 2015 (48 percent Syrah, 34 percent Grenache, 11 percent Mourvedre, 7 percent Carignan) – Located northwest of Montpellier, the vineyard consists of red volcanic soil and schist. The blend of the two soils gives the wine balance. The resulting wine has structure and grip with intense dark black fruit notes. The wild, spicy character of the Syrah and the suave taste of Grenache are in harmony. Chateau L’Hospitalet Grand Vin AOP La Clape 2015 (61 percent Syrah, 22 percent Grenache, 17 percent Mourvedre) – With a history dating to the 16th century, Chateau L’Hospitalet is a 198-acre property that includes a restaurant, hotel and craft shops. It is three kilometers from the ocean and the soil consists of limestone and garrigue. The 2015 wine has generous fruit aromas of red berries, as well as herbal and spicy notes. The wine has bright acidity, medium tannins, and a long finish that includes salivating at the end. Chateau de Villemajou Grand Vin AOP Corbières Boutenac 2015 (41 percent 100-year-old Carignan, 29 percent Syrah, 21 percent Grenache, 9 percent Mourvedre)—Chateau de Villemajou was the first estate purchased by Gerard’s father and where Gerard started in 1987. The 320-acre estate is famous for its old Carignan which are bush vines. The soils, typical of Boutenac, consist of pebbles, and the climate is Mediterranean. The wine has notes of strewed fruit, sweet spices and licorice. It is round in the mouth with delicate tannins and a long finish. La Forge AOP Corbières Boutenac 2015 (51 percent 125-year-old Carignan, 49 percent Syrah) – A tribute to Gerard’s father Georges, this wine is made from Georges’ favorite plot. The resulting wine has a powerful nose with notes of black fruit, spices and cloves. On the palate, there are red fruit notes and soft tannins. Le Viala AOP Minervois La Livinière 2015 (60 percent Syrah, 30 percent Grenache, 10 percent Carignan)—A single vineyard wine, the plot is located near the Black Mountain where wind blows through, creating a 7-to 10-degree difference between daytime and nighttime temperatures. The wine has intense notes of blackberries and violets and on the palate is balanced and delicate with smooth tannins. L’Hospitalitas AOP La Clape 2015 (95 percent Syrah, 5 percent Mourvedre) – A single parcel planted at the bottom of a 90-foot cliff, the vineyard has both limestone and marl soils. Oak trees and truffles are part of the biodiversity and influence the wine’s aromas. The wine has notes of black cherry, black currant, truffle and olive tapenade. Gerard Bertrand’s ultimate goal is to “realize the taste of the terroir and the fruit of the berry” and using biodynamic principles, along with an exceptional vintage, he has expressed this. This entry was posted in Wine and tagged 2015 Vintage, biodynamic wine, biodynamic winery, French wine, Gerard Bertrand, Gerard Bertrand Wines, Languedoc, Napa Valley Register, South of France, Wine by Allison Levine.